The villa is less than half an hour's drive from Malaga Airport, and is set in a traditional, quiet, semi-rural area on a well-tarmacked country road. The villa enjoys a very sunny, elevated position on a private 400sqm plot located between the beautiful white Spanish village of Mijas and the bustling traditional town of Alhaurin El Grande, where you can find traditional Tapas bars, restaurants, shops and local museums. Both are within 10 minutes by car. There are also numerous golf courses within driving distance. Perfect for walkers, cycling enthusiasts and families wanting to experience the real Spain without feeling too removed from the entertainment provided by the coast. The popular coastal town of Fuengirola is only 15 minutes by car and has direct train to Malaga Airport as well as buses to all parts of the coast. Although a car is essential to get the best out of the area, there is a traditional bar within walking distance and buses to Mijas Pueblo 4 times a day. Our 3-bedroom South West facing converted Finca has stunning panoramic views of the valley and mountains beyond, stretching to the sea. You can enjoy the wonderful sunsets from both the lower and upper terraces. The 2 front bedrooms, one of which has a large ensuite shower room, have patio doors and share the upper terrace with spectacular views across the mountains to the Mediterranean Sea – and beyond to North Africa on a clear day. There is additional access to the terrace via glass double doors on the landing. The south east facing third bedroom and a good sized family shower room are also on this level. Air conditioning is available in all the bedrooms. Note all beds are double beds and cannot be split into singles. The 3 x 5 metre Pool is 2 metres at its deepest and has two large steps (perfect for lying on to cool down! 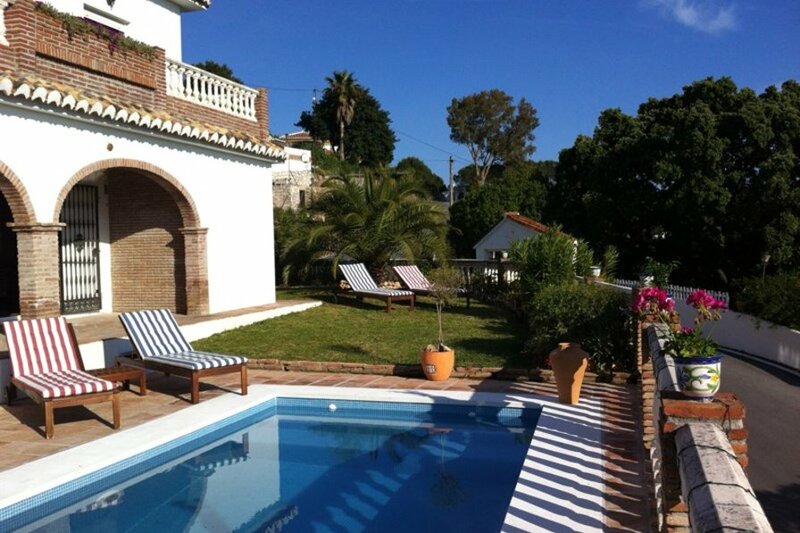 ), set in a lovely garden with wooden sun loungers and dining table with seating for 6. There is a private gated entrance with space for 2 cars. Although the nearest neighbours are within 20 metres, the garden, pool area and both terraces are not overlooked and offer complete privacy. The Costa del Sol is full of beaches along its coastline and can be explored easily by car hire or public transport. A must to try are the BBQ Sardines from the beach bars and restaurants along the beach fronts. Also there are beautiful Marinas along the coast; the most local are Benalmádena, Marbella and very famous Puerto Banus with its designer boutiques. Finca Los Gorriones is only 20 minutes drive from the nearest beaches and vibrant nightlife of Fuengirola, Benalmadena and Torremolinos, and within 30 minutes drive of Marbella. Lively Fuengirola boasts many fine restaurants, water sports, beaches, a marina and an aquapark. For those 'night-birds' there are also several discos and places of entertainment here. There are over 20 golf courses within half an hour's drive, the closest being Alhaurin Golf only 5 minutes drive and the famous La Cala on 20 minutes drive. Go-karting, Fuengirola aquapark and horse riding are all close by. Those interested in horse racing can go to the magnificent new track in Mijas. The recently refurbished Lew Hoad's tennis club is within 15 minutes drive.